In NCAA Football 08 you'll put your heart, hustle, and toughness on the line, for the right to a championship win! With all-new Leadership Control, you can boost the motivation level of your teammates by making big plays. A Campus Legend mode and even deeper Dynasty Mode puts your coaching prowess and integrity to the ultimate test. With the all-new My Shrine, Home Field Advantage, and exciting new plays like the Statue of Liberty, NCAA Football 08 is everything that's great about college football. What kind of legacy will you leave? Lead by example to boost your Skill Performance ratings as you make key plays and take control of the game in NCAA Football 08. The all-new Campus Legend mode and a completely enhanced Dynasty Mode recruiting system put your coaching prowess and integrity to the ultimate test. Can you put your heart, hustle, and toughness on the line and lead your program all the way to the BCS National Championship Game? With the all-new My Shrine, plus exciting new plays like the Statue of Liberty and Hook and Ladder, NCAA Football 08 is everything that¡¯s great about college football. Take Control and Make the Play¡ªBoost your Skill Performance and increase your overall ratings by making user-controlled plays that elevate the team¡¯s motivation levels. Enhanced Recruiting¡ªUtilize Dynasty Mode¡¯s all-new prospect search tool to hone in on recruits with specific attributes. Make sure you live up to your promises or players could transfer, damaging your coaching integrity rating. All-New Campus Legend Mode¡ªGo from a star in the high school state playoffs to a highly touted college underclassman trying to earn a starting position¡ªyou can also fastforward through any play in which you¡¯re not participating. Save and Share Your Greatest Moments¡ªCreate video highlights of your favorite plays and show them off online, or download your instant classics to your PC to share with friends. Normally I just dig right into the dynasty mode expecting to lose a few games learning the particulars of the game engine, but this time I started by trying out some of the other features. First I tried the minigames of Tug of War (you get 1 play to move the ball and then the opponent gets the same, first to touchdown wins) and also Bowling (10 yards to goal, each yard is a pin with two shots at the end zone). Next I moved on to Campus Legend Mode. And to be honest it is good enough that I have not left it. First you start out by designing a player and picking a position for them. Next you select your home school and state (high school that is) and you get put right into the high school state playoffs. I picked ROLB to start with figuring that defense is a good place for me. So first off, the only person you can control is the player you have created, so many plays are just not going to involve you. Although there is a lot more pressure because when you blow a coverage or tackle you can't switch to another nearby player to make the tackle. Once you have completed the high school playoffs, you have to select the college that you want to go to. In my case I picked Penn State because I would not be a starter, but I also wouldn't be 3rd string. Your college career consists of 2 things per day. First is practice where you get 10 reps at various plays (coach calls all plays in both practices and real games). When you make a play it is worth points. These points eventually will earn you a spot on the starting line. For me, I earned my starting spot right before the 3rd game in the season. The different strings make it interesting in the game as well. When you are second string, you are hoping for a blow out so that you can get some field time other than on special teams, where as you hope for a close one during regular play. One of the nice things in this mode, and frustrating is that the games tend to be really short. This gets a tad annoying as the load times in this game are incredibly long. Another drawback to this mode is that you may play your heart out and do an incredible job, but the team could still lose because the other half of the team is unable to get the job done. Besides the long load times, I have also seen a lot of very screen stutters and lots of xbox 360 fan and drive noise. Just seems to be slightly too intensive. Stop looking for the faults and enjoy the game! Yes, you might fumble too much, or that linebacker just jumped too high to make an impossible interception. Big deal, chances are you will probably get the same type of turnover while on defense later on. And if you don't and lose, get over it. where is the fun if you go into every game knowing you are going to win? I adore this game, last year up at college we got 12 guys together and created a dynasty. It was the best thing ever. The recruiting is a blast, and the head to head games get so heated that you have crowds coming into your room to watch these games. Despite having 12 people, we got to season 6 by the end of the school year. Another unrealistic aspect of this game is the rankings and the heisman voting. I personally got jipped, as I had an undefeated season and defeated the preseason #1 and #2 teams, but still finished 3rd in the BCS. But you know what..its great! It caused so much smack talk, and besides i ended up losing to a friend in the rose bowl, so maybe it was deserved. But I got over it and won the national title the next year. 2 Recruiting Tricks For You !! NCAA 08 FOOTBALL is the best college football game out right now. It has some gameplay flaws, commentary glitches, stat compiling errors, my game tends to constantly freeze at times, I also don't like that you can't simulate to end of game in Legend mode, but I like the fact that you can takeover an existing palyer in the Legend mode, gives you a chance to create the perfect legend.. If I am blowing out a team and my coach won't sit me, I AM TIRED OF PLAYING!! They should have kept the Heisman presentation, they may have, but I have not seen it. But this is what I like, the RECRUITING, it is time consuming but it is worth it. How many times have you created a super 5 star prospect directly for your team and he always signs to a big time school. NO MORE !! All you have to do is go to coach options, create a coach and then find a job. SEE when you create a coach he can go to any school out there. Once you do this, you can manipulate any schools recruiting board ( and depth charts if you want ), remove the prospects you want from their recruit boards and add another player. This will take away their interest and they will maintain the recruit board. TRUST ME the recruit can hate your guts but in the end, IF YOU ARE THE ONLY SCHOOL OFFERING HIM A SCHOLARSHIP, HE WILL SIGN !! You can tuggle teams by pressing Y , you can delete the coach or coaches once done and the default coach will return to the team and maintain the board you made. Like I said it is time consuming but it's worth it, you can have the top recruit class every year. Be sure to watch your recruits late in the season, because some schools will show up again with offers when they loose other recruits, just do the create coach again you can do it anytime. Make sure you do this in the beginning of every season, because in off season recruiting, these same teams can show up again, and you won't be able to control it. If this happen, you want a player to have full interest in your school. If you do it during the season the better chance they will sign during the season. If you want to find the strong pitches for recruits, just save dynasty status, find pitches for recruits and just load the dynasty everytime you find the right pitches. THEY NEVER CHANGE! Hard sell the ones you are good at. BUT THEN AGAIN IF YOU DO THE OTHER TIP THIS DOES NOT MATTER !! I have loved the EA Sports NCAA franchise since I bought NCAA 99. Each year the features expanded, creation of teams, game control, and finally the Legend feature. This year was a total waste of money. If you are thinking about buying this game, beware. The only good feature is the Legend. It has promise. It's a nice twist that you play your high school championship to determine your skills. This is better than the "try-out" option from last year. A great idea was the position only format. If you make yourself as a QB, then that's all you play. It adds a nice depth of realism and simulation. Don't get me wrong, where the rest of the game comes you 4th and inches, this feature is a 60 yard Hail Mary TD. The only change should come from play selection. Give it a nice rebellion against the coaches feel and prehaps penalties placed on your player for going against the coach. A word on game control: awkward. I have read reviews and watched many people play this. Audibles, hot routes, changes at the line; all these are more complex than need be. With previous versions, you pushed a simple button and you could alter the line. Now, you must take the extra time to read the menus and select your option. I don't have time for that. It takes much longer to call an audible than need be with the clock running down, now I have to waste more time trying to figure out how to show my blitz or call an option to shake up the line. The actual controls aren't too bad, just awakrdly placed. Menus. Holy cow! I thought MS Vista was absurd! Give me back the simplicity for graphics. Sometimes more is not always better. Enough said. Game features have suffered. For you die hard, let's just play the game with a school, I don't need to create because it's pointless; half the people who buy this game like the Create-a-School feature. I myself like to dabble with it. Here's the deal. I play on the Hiesman level (hardest) and can still walk away with the National Championship year after year. It gets boring. Even with crazy controls, pointless menus, and other absurd features that really don't enhance the games beside making it look "cool", I am still able to romp on teams and actual players sitting beside me. I am bored. So, I create a team and make it the worst you could ever have. I spend a couple of years actually recruiting the worst players. All this to make it difficult. I really get into it. I have found a new level of play after I have trashed all competition. This year's version: got rid of all the fun extras. Why? Probably to appease some yuppy who said they didn't like it. What's it cost to add this feature? What were we going to can becuase it could be added? The answer: Nothing. If something isn't broke, don't fix it. Add all the neat features that are pointless. I find the whole replay capture to be tediuos and boring. It has no bearing except to show off that someone on the easiest mode was able to lob a 75 yard TD pass. But, some people like the stroking of egos, even in a virtual world. Why not allow it. Add stuff to make it fun for those who like it. But don't take away features that die-hard fans have enjoyed for years. One more note on the "Creation" features. I understand this is simulation and EA is triving to make it fun, realistic, and accurate, but the player creation process has so many attribute options (and most don't even have bearing on performance) that I end up just making them all the same to save time. We have, as we do in most things in our lives, complicated something that could be simple and still be fun. Keep it simple. That is the best marketing strategy you can learn. I know. It's a fun game for one feature, but the rest bog it down and cause it to lose appeal rather quickly. Do I have the numbers to support this? No. It's an opinion. Don't believe that percentages some people post about how many poepl love this game or love this feature. Remember, 42.7% of all statistics are made up on the spot. Major improvement from last year! The best football game to date. NCAA 2008 for the xbox 360 is by far the best football game to date. The game play is precise, sharp and intuitive. No Longer will my RB get caught on my line or my DB make super human jumps for knockdowns. They jump realistically and normal not super. Graphics are great, the crowd look life-like and active, the whole games just look beautiful. Sound has been improved as well, no more just fight songs, NCAA 08 has orchestrated music and helps to get you into the game. Dynasty mode is back and better than ever with indepth requiting, and streamlined play. To sum this game up frankly: horrible camera, clunky controls, laughable animations, the players look like they're wearing plastic uniforms, player models are cartoonishly out of proportion, the team stats mean nothing, the frame-rates are inconsistent and stutters when menus load...and the list goes on. I'm not big on the extra features, I just like to play exhibition matches and this game fails miserably. What happened since NCAA 2006? I enjoyed that game thoroughly on PS2. The controls are intuitive and responsive, and the game has a smoother, faster feel to it. It's not perfect, but it is at least enjoyable. Making plays on defense was actually possible in that game. I always control a defensive tackle and getting off blocks is next to impossible in 2008, against any team. Why EA moved away from the 2006 controls, I don't understand (this goes for Madden as well), using the right analog stick to juke/swim/hit was great and allowed for very fluid gameplay that shoulder buttons can't emulate as well. As other people have said, switching the controls for every version is confusing and annoying. 2006 had it right. A Pretty Nice NCAA Game! Not What You Have Played In The Past!!! I bought this game reading the reviews and giving it the benefit of the doubt since I hadn't had an NCAA football game for 360 yet. I have mixed feelings on this game...I guess it just depends on what type of gamer you are. Just about everyone brings up valid points...and I'll just re-iterate on a few. This game seems to be developed more for those who want to either coach the game or feel like they're a real player in the game. Me, I never played football so I couldn't really tell you what a good play is for what situation and what type of coverage is needed when and where. I just ask Corso or go with my gut feeling (which I'm usually wrong). I supposed if you've played football before than it's a pretty fun game. Plays are broken up by formations, passing, running, short passes, mid passes, defensive coverage types. For me though, yes the play clock is a disadvantage. By the time I figure out what play I want I'm usually about to get a delay of game penalty. I got used to how the last two years of NCAA had the plays set up, and now I'm just lost while picking a play. Campus legend mode is fun. While you do have the option to simulate practices and scheduled events, basically you can through everyday of the season and practice to earn points to pick up on the depth chart, and do evening events to gain attributes like popularity and awareness and pick up your GPA. Unfortunately for me, my player sprained his ankle playing a game of pickup basketball. But for those who don't like to sit there and pick apart everyday of someones life...than Campus Legend might not be for you. As for the gameplay. The graphics are nice. The stadiums and players look great. There is a long loading process though, and there are about one second delays after you pick plays. This slows the game down and bugs me out. There are no more cut scenes to cheering fans or cheerleaders. The broadcast of the game is lame. Though I leave replay option on cause every once in awhile I like to see a nice play, but there's replays for like every first down and this gets annoying. Also, someone must have got injured every other play. And I've played like 5 games now and there hasn't been a single penalty called. I started playing at freshman level just to get a feel for the game, and again I consistantly win 73-0. When I moved up to varsity I played with #2 Michigan against an unranked Notre Dame team thinking it would be good to start against a weak defense like Notre Dame and move up to higher competition. (We all know tho no names are used real player attributes and number and defensive schemes are still a factor). After a successful first drive. Notre Dame's QB came out and made last years QB#10 (Brady Quinn) look like a joke. Their qb could of just lofted it in the air and it would be caught. When I got back on offense my offensive line couldn't hold the defense away from my QB. Must've gotten sacked or pressured every play. And when I tried to pick apart Notre Dames weak secondary (w/ the exception of SS#9 (Zibikowski) they looked like gods. Notre Dames defense looked like the '85 Bears out there. So, until I get used to it again...I have to settle with winning 73-0 or losing 42-14 everytime. Like most said, no create a team, create a play...there's no alternate uniforms and pants like in previous years. I can't wear ND green, or change Clemson's pants to purple if I really wanted. Basically, for those who really know the game of football and enjoy being a real player in it and maybe the coaching experience of it (Dynasty Mode/Recruiting) than go for it. For those that enjoyed the broadcast like of the game and just had fun playing the simple version of the game of football...than save your money. If your someone like me, who really enjoys putting up 30+ points a game and lots of yards then this game is not for you. You cant go one game without committing numerous turnovers, and running the ball is almost impossible because the CPU will "jump the snap" one every three plays. You'll only have 3 seconds to throw the ball or your sacked (regardless of how good your o-line is or who your playing) because no one will pick up the blitz, and its hard to not throw a bunch of interceptions. I guess in a way it is more realistic, but it takes the fun out of the game. As far as graphics and features are concerned this game is phenomenal! The graphics are very smooth and the gang tackling makes a bigger difference than you think. Campus Legand is pretty cool and the recruiting process is much deeper. I've had this game a week, and I've played a few games. I've been playing ncaa football ever since Bill Walsh football for the SNES. Here are my current observations. i will begin by saying that I enjoy playing the game a lot. 1. Probably the most annoying thing is that the commentary will lag almost a whole play behind. 2. I miss the create a school option, not so much for being able to create m y school, but at least it gave me access to play the fight songs. 3. The sideline teammates, not only just stand there and clap, but their facemasks aren't even the correct color. I play as Oklahoma, and on the field, the facemasks are white, but on the sideline, they are dark blue. 4. I wish they'd keep the stiff arm buttons as RB and LB. It shouldn't be the A button. I keep forgetting this and i fumble the ball as I tend to hit L trigger after LB does not work. I'm teaching myself to hit A button though. 5. During bowl games, i wish they at least put each team's end zone design in there instead of some generic stuff. 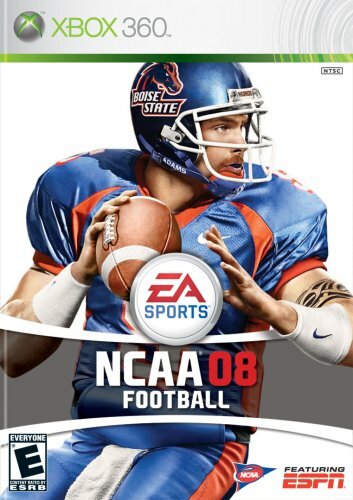 EA sports has done it before, and they do it in the OU-Texas game, so it shouldn't be that difficult. 6. Even though they've tried, i wish the crew would work on even more new dialogue. 1. The animation, especially tackling and mid air collisions is way improved. 2. the players, for the most part move a heck a lot smoother. 3. i'm glad they have more stadiums in the game, THe fact that the Alamo Bowl, played in the AlamoDOME played outside was inexcusable. I'm still debating if i like the instant replay saving stuff yet. I like how fast it comes up at the end of the game, but the viewing options are quite limited afterwards. It is nice, however, to relive the time the guy dove for my endzone, and i whopped him in mid air, and he fumbled and I recovered to keep him out. The game isn't as bad as some people on here would lead you to believe. After playing a little longer, I've discovered a couple of more things about the game that I would like to comment on. Turn down the clipping attribute to almost nothing. I had about fifteen clipping calls, so I turned the slider waaaaaaay down, and it still called them, but not as often, but almost. Secondly, while I like that the stats come up at the bottom of the screen, EA no longer lets you know if they are career, current season, or just that game's stats.